You know it’s tough to convey some foundational biology concepts—and it’s even tougher when you’re adjusting to the Next Generation Science Standards. 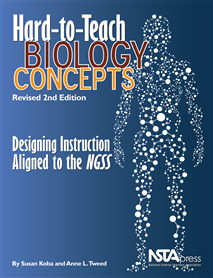 This thoroughly revised book is designed to support you as you plan and implement NGSS-aligned lessons that will engage students with biology concepts that many find especially challenging. The book is organized into two parts that feature an instructional framework and resources that support framework implementation and is designed for both veteran teachers and newcomers to the classroom. Part I, The Toolbox, introduces a research-based Instructional Planning Framework that helps you to understand the learning needs your students bring to class, incorporate appropriate teaching strategies, and interpret the framework and teaching tools through the lens of NGSS. Part II, Toolbox Implementation, models use of the framework with four hard-to-teach topics, all different from the ones in the book’s first edition. Contributing authors show you how the framework helps teach the NGSS’s four disciplinary core ideas: growth and development of organisms, ecosystems, heredity, and biological evolution. As the contributing authors make clear, the teaching models are specific and help to make student thinking visible, but they don’t presume to dictate what’s right for you. Rather, the book will open your mind to fresh, effective ways to help biology students deepen their conceptual understanding based on what works best for them and you in today’s classrooms.